100% LEAD FREE CRYSTAL - Our hand blown lead-free crystal decanters add radiance to any room or kitchen with a modern yet elegant design. Impress your guests, amplify the ambiance and enhance the purity, aroma, and taste of your favorite red or white wine with our wine pourer. Great for a merlot, cabernet, pinot noir, port and other bottles of wine. PERFECTLY ENGINEERED FOR A STANDARD 750ML BOTTLE - Don't be tricked by other manufacturers claiming their decanter has a volumetric capacity of 1700ml or more. The volume is pointless! What really matters is how much breathable surface area 1 bottle of wine is exposed to in the carafe. When an entire bottle of wine is poured into OUR decanter, the wine reaches the widest diameter on the decanter allowing for maximum aeration! This is one of the only wine accessories you can't live without. EASY POUR SLANTED SPOUT - Avoid spills & drips with our specially designed large slanted top. If you are a wine drinker, you will appreciate how our 32 oz / 750 ml wine breather enhances the taste. MAKES THE PERFECT GIFT - One of the best gifts or presents for any "wino". The perfect gift idea for wine lovers, enthusiasts, women, men, dad, mom, husband, wife, grandparents and more. 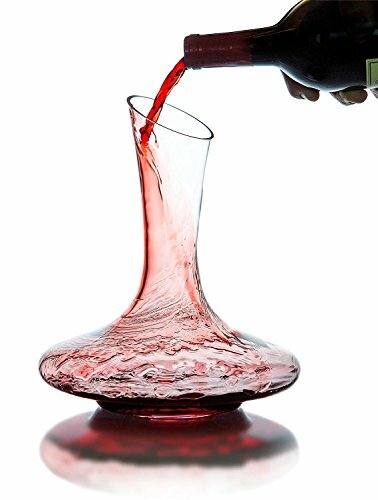 Surprise your wine connoisseur friends with a unique wine gift for Christmas, wedding, birthday or other holiday. Goes well with related wine gift sets. If you have any questions about this product by Le Chateau, contact us by completing and submitting the form below. If you are looking for a specif part number, please include it with your message.